Quick, nimble and controlled….. Am I describing you or the Kookaburra Xenon Ultralight…. Well if it’s you and you haven’t yet met this hockey stick, perhaps its time to introduce you! It’s rare to review a hockey stick with such a specific purpose that isn’t drag-flicking. Yes the Xenon UL from Kookaburra has the brands fantastic Low Bow which is for drag-flicking. This awesome stick is really about one thing, it’s weight! With the 37.5” Kookaburra Xenon Ultra Light coming in at 520g this is one of the lightest sticks I have review until now. Why do they make a hockey stick so light? The first reason is maneuverability. Obviously it depends on your strength but being able to move a stick quickly has a number of benefits. Dribbling with the Kookaburra Xenon UL is the first thing to share with you in this review. Personally I am a bit of a lumbering old beast and I have always stayed with heavier sticks because I thought a ultra light stick wouldn’t help me. However I started to come round to the idea that using the Kookaburra Xenon might help me. The ability to turn the stick and therefore the ball, gave me options when pinned by a defender that I don’t normally have. It actually makes up for the fact I am not so quick myself by letting me manoeuvre the hockey stick faster than I can go. This lets you rely on dribbling skill rather than pace to fool the defender. Another bonus of the Ultralight Kookaburra Xenon is that it’s generally more comfortable on your arms. Carrying this stick around for a number of games now I notice that my arms appreciate the fact I’m not swinging a great hunk of carbon around for hours at a time. The next great thing about the Kookaburra Xenon being soooo light is that you can swing it quickly. 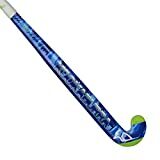 Because the stick is so light I was worried that it wouldn’t be very powerful, however because of the speed at which you can swing the Kookaburra Xenon back and then forward on to the back of the ball it actually connects really well. No doubt the power is helped by a couple of non-related features of the Xenon Ultra Light hockey stick. First the carbon fibre content is high for such a low priced hockey stick. At 95% carbon fibre this stick is stiff. With stiffness comes power. I haven’t yet managed to speak with Kookaburra about how they manage to produce high carbon content sticks so cheaply, for the material purists out there perhaps the quality of the carbon isn’t the same as other brands use. Even if a question of quality is the case, the high carbon content in the Kookaburra Xenon UL does what it is supposed to and makes the hockey stick stiff. You get that great “ting” noise when you strike the ball so there is no doubting the material content. Ok it is not as powerful as some sticks but the Xenon Ultralight isn’t really about power. What you miss in bruit force (which isn’t huge) you gain in pushing power. It is possible to push a pass these days, you don’t have to just slap it. In fact if you are dribbling in to and round defenders a decent push pass is essential. This stick really does push pass the ball well. Combining the weight with the low bow makes this possible as you can force your hands through the ball very quickly and the lower bow slingshot’s it out from under you. To summarise, the Kookaburra Xenon Ultra Light is going up with my favorite hockey stick reviews as a must have for dribbling. Also a stick with this many features for the price you can buy it at online fall firmly in to the “value for money” section. Notice I say “value for money” not cheap, this is a great stick and the fact you can pick up a Kookaburra Xenon for less than £100 in the UK is amazing, get it while it’s hot. The 2015 model has Kookaburra’s Tri-Core technology, which further increases the power of this stick. If you can get one of those for less than £100 you will have a real bargain. But don’t worry too much, if you are working to that budget there is no other real change between previous models and you will still get a fantastic stick. Though this is a low bow, it’s not too extreme as it’s only 21.5mm compared to some other sticks being as much as 25mm. You will have to adjust if you aren’t used to this bow position but the Xenon is a nice way of easing you in to low bow sticks.